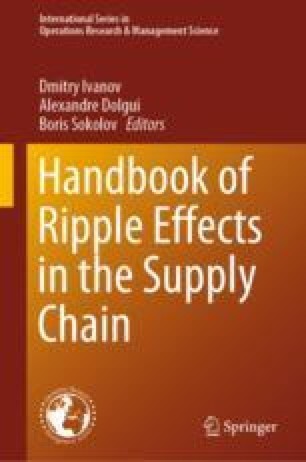 This chapter studies the impact of accelerating digitalization on supply chain risk management. The interrelationships between digital technologies and supply chain disruption risk are analyzed using multiple case studies from various industries. The empirical analysis guided a conceptual framework based on extant theory and specific hypotheses. The chapter concludes with a discussion of research opportunities for future study. In particular, the discussion involves perspectives and future transformations that can be expected in the transition toward cyber-physical supply chains. What are the most important supply chain disruption risks that your company is concerned about? Which disruption risks did your company experience in the past? What are the reasons for the disruptions experienced at your company? Identify/estimate impact of one type of disruption on another…e.g., supplier disruptions led to production capacity disruptions which led to …. Which processes of your supply chain (e.g., outbound logistics) are mainly affected by disruptions and what KPIs (e.g., on-time delivery) do you use to measure the deviations caused by disruptions? Please describe how a recent major supply chain disruption was managed. Is there a disruption recovery process in your company? How it looks like? Have you experienced a supply chain disruption that could have been better managed? Please describe the situation and what you would do differently next time. Which of the following digital technologies do you use in your company’s supply chain operations? Which digital technology (if any) best supported your managing a disruptive event, and how? Which functionality in the digital technology was missing when you applied it to disruption mitigation and recovery? Has digital technology hindered you from making a better decision in case of a disruptive event? Can you describe the situation and the obstacle of digital technology? How digital technology does/could support your risk mitigation process? Do digital technologies help to increase SC resilience at the pre-disruption stage? How digital technology does/could support your disruption recovery process? Do digital technologies help to increase SC resilience at the post-disruption stage? Do digital technologies help to increase SC efficiency? Ben-Daya, M., Hassini E., & Bahroun Z. (2018). Internet of things and supply chain management: A literature review. International Journal of Production Research. https://doi.org/10.1080/00207543.2017.1402140. Panetto, H., Iung, B., Ivanov, D., Weichhart, G., Wang, X. (2019). Challenges for the cyber-physical manufacturing enterprises of the future. Annual Reviews in Control. https://doi.org/10.1016/j.arcontrol.2019.02.002. Priore, P., Ponte, B., Rosillo, R., & de la Fuente, D. (2018). Applying machine learning to the dynamic selection of replenishment policies in fast-changing supply chain environments. International Journal of Production Research. https://doi.org/10.1080/00207543.2018.1552369. Rossit, D. A., Tohmé, F., & Frutos, M. (2018) Industry 4.0: Smart scheduling. International Journal of Production Research. https://doi.org/10.1080/00207543.2018.1504248.